You can assume the endeavor to end the Syrian people’s tragedy is wholehearted once you hear them talking at Geneva-2 of a binding ceasefire under Chapter VII of the UN Charter. The watchword is “ceasefire.” After that, they can talk ad nauseam of the need for a shared transitional government with full powers or for national elections next year in which everyone can stand. The Syrian opposition would overburden itself, disharmonize internally and bicker with allies if it carped too much about the immortality of Assad running for a third term, or about the irrationality of a transitional government that includes people with blood on their hands. At Geneva-2 – if it convenes at all in mid-month – the spotlight won’t be on the government and opposition delegations. The spotlight will be on the U.S. secretary of state and Russian foreign minister. They will be doing the hard bargaining. More exactly, the public eye will be on an American-Saudi-driven international stab at goading the Russians to the UN Security Council. The Russians have been resisting this for two years while the Syrian people were being butchered. They, and the Iranians in tow, kept repeating: a political solution is the only way forward in Syria. They also kept extolling the merits of the June 2012 Geneva Agreement, which provides for the immediate cessation of armed violence in all its forms and the establishment of a transitional government. Everyone is now transfixed by the word “negotiations,” when and where they would take place and how a transitional government comprising regime and opposition representatives would be set up. But the cardinal provision in the Geneva Agreement –i.e. “the immediate cessation of armed violence in all its forms” – is being overpassed. The regime does not want a ceasefire. The Damascus government and its allies know they can only survive by armed violence. The regime dithered when it was whispered that a binding ceasefire is in the cards, which is why the Russians had to literally tug Damascus to the negotiating table. To underscore the importance of a ceasefire for the political solution, we need to trace the Syria crisis back to its roots. The crisis is not between eastern Syria and western Syria, or between two sects. The opposition, for instance, is not after winning a bigger share in parliament for Aleppo. At the same time, Damascus is not after specific ministerial portfolios for people to draw parallels between Geneva-2 – if it ever convenes – to the meeting of rival Lebanese leaders in Taef in 1989. The Syrian revolution is fundamentally the revolution of a national and multi-sectarian population striving for freedom in all governorates. The population is not making sectarian or provincial demands. Like the Egyptians who flooded Tahrir Square before Hosni Mubarak’s resignation, the overwhelming majority of Syrians forgot all their differences to clamor for regime change, freedom and dignity. A Syria ceasefire does not mean a pause for talks and the demarcation of frontlines between the sides. What you now have is a Syrian majority wanting to get rid of an oppressive regime and build a new Syria on the same landmass and within unaltered borders. At Geneva-2, the Syrian regime will try to avoid this. Not to be overthrown, it would propose a constituent assembly to draft a new constitution that keeps it in power. It would want to exclude the so-called Takfiri forces it lured into the conflict in the first place. It could perhaps request the eviction of foreign volunteers from Syrian soil or claim legitimacy to commit this individual or that to justice. In a show of humility, or in order to waste time, it might even propose a national reconciliation assembly. What is certain though is the regime will do everything in its power to wriggle out of committing to a binding cessation of armed violence in all its forms. Something similar happened in early 1999 at Rambouillet, a commune in north-central France, which hosted talks (between then-Yugoslavia and a delegation representing the ethnic-Albanian majority population of Kosovo) on the Interim Agreement for Peace and Self-Government in Kosovo. They were familiar with the brutality and intransigence of Serbian and Yugoslavian leader Slobodan Milosevic. They knew him from the earlier 1992-1995 Bosnian War. They were aware the only way to convince him is by force. He was a prototype of today’s Bashar al-Assad, who represents a sect instead of a population and fights for sectarian instead of national interests. Like Milosevic, the only way to convince him is by force. Only when cruise missiles and airstrikes reach his bedroom, instead of the Syrian people’s heads, would Assad yield and negotiate. The Russians invariably clone themselves. They were the ones who obstructed a workable and quick fix solution in Kosovo. They are doing the same in Syria now. 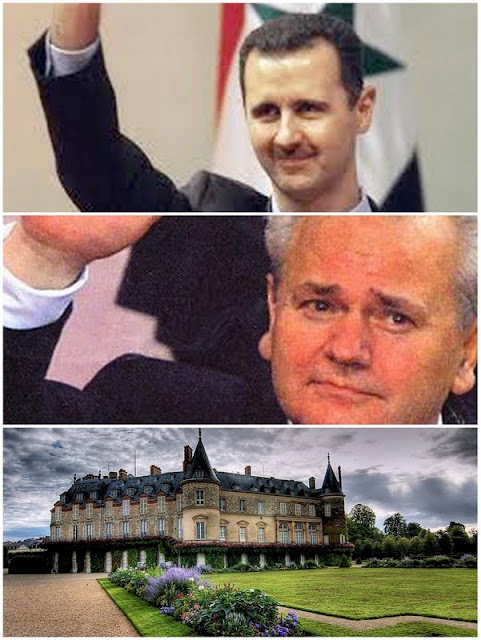 The Americans and Europeans had no choice back in 1999 but to get the Russians to Rambouillet and sanction an interim agreement, which did not last long but opened the door for NATO to do what it should have done from the beginning: air bombardment. That’s the thing to do after Geneva-2 if the Friends of Syria want to end in earnest the Syrians’ suffering. Assad cannot put up with a strict and binding ceasefire. Given the carnage and bloodshed to date, peaceful protests against his rule will erupt in every Syrian city and town the moment he commits to one. And he wouldn’t swallow today the mass protests he could not tolerate two years back. The regime will breach the ceasefire without any doubt, just like Milosevic. Geneva-2 having bound all sides to the ceasefire under Chapter VII of the UN Charter, everyone would then have to go back to the Security Council. I expect the opposition’s National Coalition and the head of the Free Syrian Army’s chief of staff, Gen. Salim Idriss, to commit to such an agreement. Commanders of the FSA and rebel brigades, including Jabhat al-Nusra, would be put on notice that they too would be bombed if they breached the ceasefire agreement. I doubt Geneva-2 will be held at all -- short of a genuine about-face by Moscow, not Iran or Syria.